Check out the brand-new 2019 Mazda CX-3 at Spinelli Mazda in Lachine and see what more it has to offer than the 2018 Hyundai Kona! 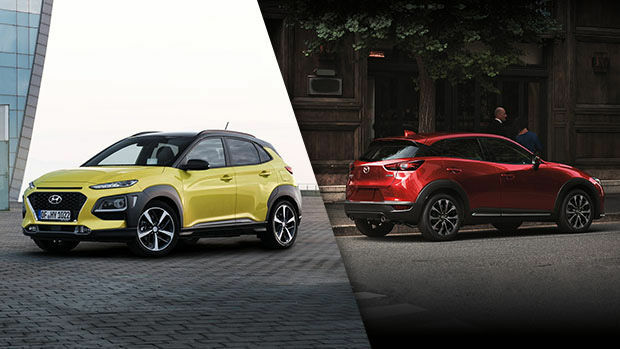 Test drive the new 2019 Mazda CX-3 at your Mazda Spinelli dealership in Lachine and see all the benefits it offers compared to the 2018 Hyundai Kona! Sporty looks, lots of amenities and fuel economy are on the menu of the 2019 CX-3, which is doing very well in this very lucrative market of subcompact utility vehicles. Just one test drive will convince you to go for the Mazda SUV instead of the Hyundai SUV! Under the hood of the CX-3, you will find a 2.0-litre SKYACTIV-G DOHC engine with 148 horsepower and 146 lb-ft of torque, which is much better than the engine that powers the 2018 Kona. In addition to offering more power, it is much more energy efficient than Hyundai’s SUV, with only 8.6/7.4 L/100 km (city-highway), compared to 9.2 and 7.8 L/100 km for its rival. The CX-3 is also cleaner, with emissions of 3780 kg/year of CO² against 4160 kg/year for the Kona. You will also appreciate the CX-3’s powerful i-ACTIC 4-wheel drive system, which promises you agility and manœuvrability on all types of roads! The Kona’s maximum cargo space is 1,297 litres (46 cu. Ft.) when the rear seat folds down while the Mazda CX-3’s hatchback opens up to a cargo volume of 1,528 litres (54 cu. Ft.). The 2019 CX-3, near the West Island, also features a number of breakthrough technologies such as SKYACTIV Dynamic Vehicle Control with G-Force Control, which gives you precise steering and remarkably stable road handling, slope start assistance, the intelligent city brake assist system, blind spot monitoring and rear cross-traffic alert, to name just a few. You may also benefit, depending on the model, of air conditioning, heated front seats, a 7-inch touch screen with MAZDA CONNECT system and much more. While the 2018 Hyundai Kona powertrain is only guaranteed for 5 years or 100,000 km, the 2019 Mazda CX-3 is covered by Mazda’s unlimited mileage warranty, which also applies to the 2019 CX-3’s basic warranty. By buying or leasing the new 2019 Mazda CX-3 at the Spinelli Mazda dealership, located in Lachine, you also benefit from Mazda promotions and Mazda financing. As you can see, it is very advantageous to opt for the CX-3 rather than the Kona. So, come and choose your Mazda SUV as of today at Spinelli!